Lineage: Audience recording. Roland Edirol r-05, CA14 cardioid, 96/24, circulated direct from master in .flac format from the original taper. Note: Ace Frehley was the opening act, and used the same backing band as Gene. 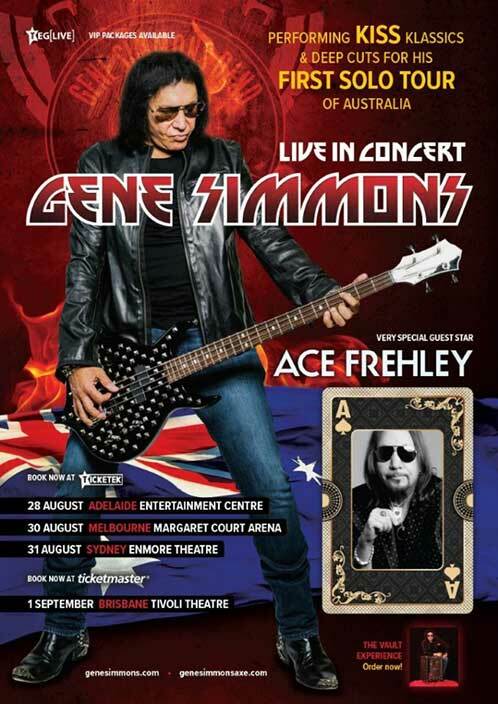 The show venue was originally the Margaret Court Arena, as shown on the poster below, but was moved to the smaller capacity Festival Hall. A 10 year old fan plays guitar with the band on 'Calling Dr. Love'. School Of Rock cast member 'Amy Lehpamer' performs lead vocals on 'I Was Made For Loving You'. Ace joins the band to play during the final two songs.